Arguably, the film Predator gave us one of the greatest movie creatures ever. It took cunning and some luck for Arnold to defeat it. Our wildlife gardens can also contain predators that are as malevolent and ruthless as that alien creature in the movie. Domestic cats that are allowed to run free are known to exercise their predatory instincts. 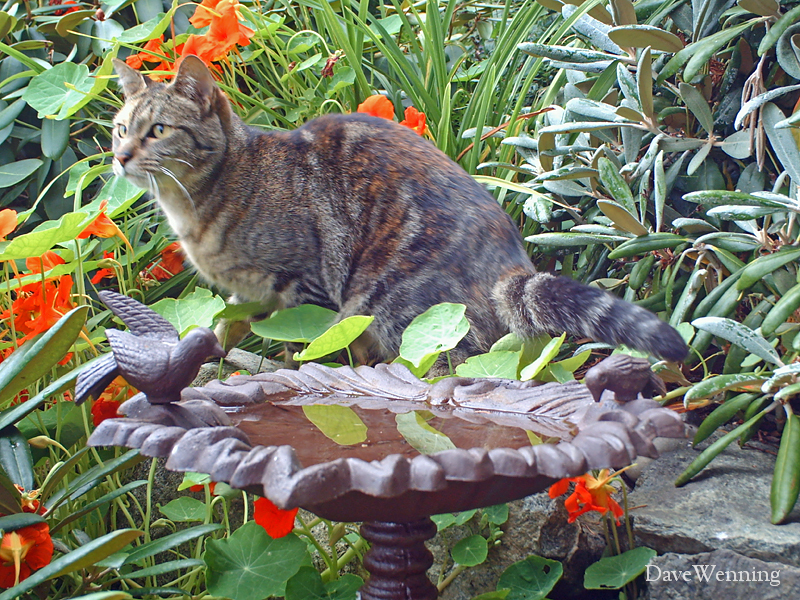 One blogger did the math and came up with an estimate of 1.7 billion birds killed by outdoor cats annually in the United States. If you think that is an overestimation, divide it by 1,000 and the number is still too large. My neighborhood serves as an example. When I first moved here, there were several cats, perhaps a dozen, that roamed the area. I came to recognize them, Black Spot, Scruffy, Gray Stripes, Calico, Scrawny and so on. My own indoor-only cat Big Guy took great interest in them. When driving to work early in the morning, I would often see coyotes around Fidalgo Elementary School. When they started clearing for homes near the school, the coyotes moved into my neighborhood. Very suddenly, all the neighborhood roaming cats disappeared. The predators became the prey. I haven't seen a cat roaming the yard in twenty years. That's why the appearance of this cat in a BirdCam photo took me by surprise. Before this, I wasn't concerned about the siting of the birdbath. Fortunately, the cat has been an infrequent visitor. This is a nice looking cat and obviously well cared for. But if his owners don't keep him indoors, he'll be coyote food for sure. Arnold Schwarzenegger taught us a lesson in the movie. Regardless how well equipped, no predator is invincible. Tis true, kitties do hunt, mine included! I've heard similar figures for cat based bird kills this side of the pond too. I have to admit to being rather fond of cats but it does make you think. I've never seen the cat lifespan figures before. I expect in the UK outside cats would live longer as there's probably less out there to kill them.